New York City Business Improvement Districts (BIDs) serve important functions for improving maintenance of commercial districts and for promoting commercial activities. Suppose you are a researcher trying to answer the question if higher government spending correlates with lower levels of 311 complaints about public health & safety and street & sidewalks, you can use our data quick access tool to generate the data set you would need for your studies. 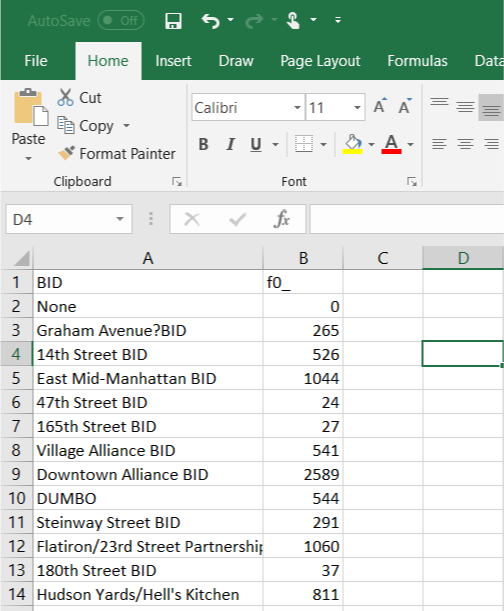 In this case, suppose we are using Fiscal year 2017 as our target date range, then we aggregate the filtered data set by BID so we can easily merge with the FY17 BID Trends Report Data published by NYC Department of Small Business Services on NYC Opendata. Lastly, don't forget to double click the download button. You will see the BIDs names on the left and the counts on the left. We can get rid of "None" since we only care about BIDs in this case. Step 3: We combine the downloaded data with the FY17 BID Trends Report Data using a simple VLOOKUP applied on the BIDs names. If you are using Python or R, you can merge on the column names of the two dataframes. We then normalize the complaint counts and total expenses by total service area. To get more intuition about the correlation, we can make a quick scatter plot using the plotting function in Excel. As we can see above, excluding the outliers, higher total expenses in each BID negatively correlate with the 311 complaint counts about public health & safety and street & sidewalks, suggesting lower complaints about urban conditions are related with higher spending on improvements in commercial districts. Then, you can generate complaint growth rates or conduct time series analysis in the units of your choice, such as month, year or week. Using the data quick access tool saves researchers a lot work including downloading the huge data set from Opendata, then struggling to filter the data set by complaint category, time range, most importantly, geocoding each data entry to its corresponding BID. Our tool takes away all these middle steps that trouble researchers and helps bring results to the table in a few clicks of buttons, enabling not only researchers, but also those who are interested in using 311 Opendata yet barred by the technical barriers.